The airport is not a fun place. It's always boring, often disappointing, and regularly infuriating. We get it. That being said, that's no excuse to set your luggage on fire. We cannot discourage you enough from committing an act of arson in an international transit hub. And yet, as you can see in the video below, an angry, angry man did that on Thursday. Dawn reports that he was supposed to be on a 7am Pakistan International Airlines flight from Islamabad International Airport to Gilgit, Pakistan. The flight was delayed for technical reasons and was subsequently canceled over bad weather. Frustrating? Yes. Understandable? Probably. Customers waiting for the flight did not find it understandable. Passengers were filmed shouting at airport personnel, and even shoving a senior staffer. And this guy did this. It's hard to say whether he saw it as a symbolic gesture or if it was simply a fit of rage. But he lit his luggage on fire inside the airport. The fire was quickly extinguished by Civil Aviation Authority firefighters, and thankfully no one was hurt. 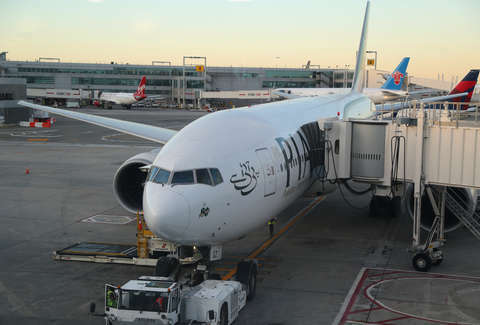 A spokesperson from Pakistan International Airlines told Dawn that passengers were moved to hotels until their new flight, scheduled for the next day. “No airline can risk flying a passenger plane in bad weather,” the spokesperson said. "PIA has opted to forgive and forget the incident that happened at Islamabad International Airport on November 15."